Within that 45 minutes of time, I was able to disconnect from everything in my life that caused stress and anxiety, and just focus on bettering myself. I worked as hard as I could, pushed myself to the max, and just when I thought there was nothing left in the tank, Angela said over the mic, "take all your fears and your worries, and place them on your handlebars and ride through it...". At that moment, I pushed for everything good in my life, every reason I was alive, and every reason why I had gone to rehab to get sober. Then I felt the tears, the tears mixed with the sweat pouring off my face, all coming together as one, they were tears of joy! This was me at my best, fighting for everything I believed in! I WAS ALIVE! I will never forget that day. I think about it every time before I teach. After everything I experienced in that first class, I realized something while we were stretching. Angela had given me something. Now WHAT that something was cannot be put into words. It was just an overall emotion. I decided right there and then, that my goal was to give that emotion and feeling to others, to try and help others achieve their greatest goals — and be the best they could be. That was my inspiration three years ago, and it is still my inspiration today. It is what I bring to every class. How leading the pack different from being a rider? This is a tricky one... I would say the biggest difference would also be the biggest similarity that we share with our riders. We are all in that room to put ourselves out there — to try something new, to push ourselves beyond what we think is possible. The difference is where our bike is located within the room, and how the lights are directed onto us. The beauty is that we all walk out of that room stronger than we had walked in. My biggest motivation is to continue to stay sober. Because with that, I can be the greatest son/brother/friend/SoulCycle instructor I can be. I motivate myself to be great, because I know I am capable of great things, and I surround myself with family and friends that inspire me to reach for greatness! My first tattoo I ever got is located on my left forearm. It is something my father has always told me. I try to live every day by this mantra: FEAR NOT. 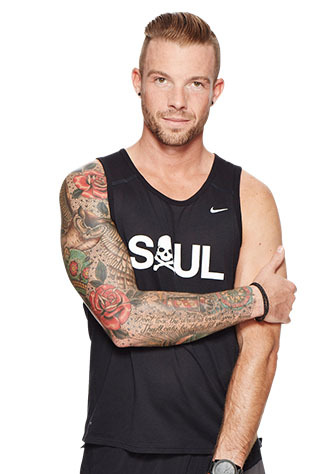 Catch CONOR at SoulCycle Brentwood this Saturday (9/12) at 7:00 AM! Back on the East Coast, catch classes with him at SoulCycle Greenwich and SoulCycle Soho — and follow him on Instagram at @conzsweetpics and @conzcrew. Questions or comments? Email blog@soul-cycle.com!